The start of the fiestas in honour of the patron saint of Pamplona is marked by the firing of a rocket - the Chupinazo. 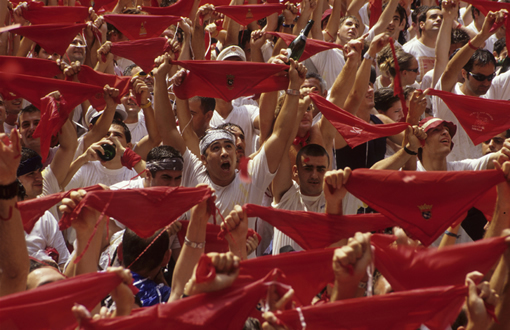 On the 6th July, a mass of revellers congregate in front of the Town Hall to witness one of the most moving moments in the San Fermin fiestas. Shortly before midday, all the municipal councillors come out onto the Town Hall balcony from where twelve rockets announcing the start of the fiestas will be fired. In the square below, a sea of red kerchiefs are held high in the air, as locals and visitors alike anxiously wait to knot their kerchiefs around their necks. At that very moment, the councillor chosen to fire the rocket addresses the crowd and shouts "Pamploneses, Viva San Fermin, Gora San Fermin" (People from Pamplona, Long Live St Fermin). The response is immediate, an explosion of jubilation, of mass craziness invades the square and its vicinity, full of people uncorking bottles of champagne, singing and dancing to the sound of the street bands and who have no intention of resting until the 15th July. You need to consider that there can be moments of stress and pressure, together with the suffocating heat, due to the mass of people present in this relatively small square. And, although no serious incidents have occurred, people are frequently cut by glass from broken bottles on the ground. It's best to get to the square at least one hour before the rocket is due to be fired, to get a good place and to enjoy the pre-fiesta atmosphere. Ten minutes before midday, the ones who have still not managed to get in, start to push their way through the crowd, creating small avalanches and a feeling of suffocation. It is definitely not advisable to take children to the square as they run the greatest risk. The streets surrounding the square are a good alternative for starting the fiestas. These are less crowded but offer the same festive atmosphere. A giant screen is installed in the Plaza del Castillo square, with live viewing of the events in the Town Hall square. Another screen is located in the Paseo de Sarasate walk, which is an ideal place for families with toddlers. The red kerchief is essential, but it should not be knotted around your neck until the rocket is fired at midday; tie it around your wrist or keep it in a pocket until required. Immediately after the rocket, it is the custom to knot the kerchief around your neck and leave it there until the closing ceremony of Pobre de Mi on the 14th. It is also advisable to have a bottle of champagne, which can be purchased in the streets surrounding the square. With regard to the rest of your clothing, this is not the best day to wear items of quality. Whilst waiting for the rocket, many people in the crowd enjoy spraying litres of drink, which will more than likely end up on your clothes. You should also wear sturdy shoes - anything can be dropped on the ground. At the end of the opening ceremony, it is the custom to leave the Town Hall square by the streets of Chapitela and Mercaderes.